Supermercado 2000 Spar La Paz is known by gourmet cooks in Tenerife. Sorry, I took a photo the other day of the new shop front with Coviran which i have to find for you. Indeed Coviran took over all the shop's names including Supermercado 2000. By now, bus drivers will only talk about the Spar Titsa bus stop. almost opposite La Paz look-out near Plaza Laurel town sqare. Business hours: Contrary to past years now open from 9 a.m.to 9 p.m. Expensive Tenerife shop or not? Some say that Supermercado 2000 Spar alias Coviran has pharmacy prices but, foreigners in La Paz with a holiday home in Tenerife fill up their baskets in there to the brim, nevertheless. 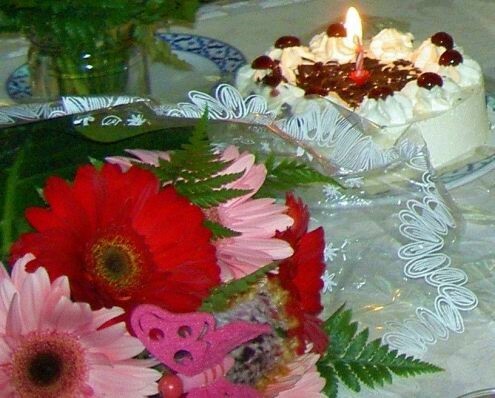 Besides, the cake shown above is a real bargain. Shopping in Tenerife in this beautiful Spar shop in La Paz is a treat. When I asked an elderly German gentleman in the shop if he didn't find some things a little expensive he answered: "So what, this is where we meet everybody who lives here and more!" Besides, Suma Spar Puerto Cruz La Paz stocks more than 1500 German products of quality brands. La Paz Puerto de la Cruz is one of the most prestige tourist spots for Germans and Scandinavians, in particular, on Tenerife Island, indeed. You hear some elderly English speaking folks in la Paz, too. Its Spar is a symbol for special people like the elderly man I talked to. However, I also saw many Spanish people mounting a tourist bus beside shop SM 2000. They were taken to a Fiesta party on this October day. Seeing the Spaniards made me wonder, if they also shopped at Supermercado 2000 Spar. What is best about this La Paz SPAR shop? 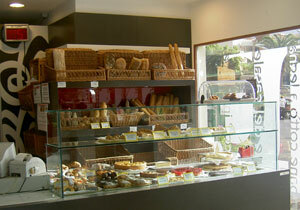 It has a fresh bakery stall which sells real yummy pastry, too. Vitamins and mineral products are cheap at Supermercado 2000 Spar now Coviran. I buy my Vitamin C and Magnesium there. The type which bubbles up in water, you know..
Also, after Christmas and Easter, for example, Supermercado 2000 Spar alias Coviran sells specials at reduced prices. The articles are international seasonal sweets, cookies, chocolates and sometimes cakes which are never old and tasteless. As this Spar imports almost everything from Germany to Tenerife, Germany's strict rules for freshness apply. In fact, expiry dates apply to just about every perishable product sold at Spar, even in tins. Spot the most amazing products highly reduced by price one day after their expiry date. This also applies to Christmas sweets, such as special cookies and chocolates, once the holiday is over. By the way, more good Spanish food brands have been filling shelves at Spar Tenerife supermarkets by 2015 at Suma Spar Coviran. This is one fact I love about Tenerife shopping at Supermercado 2000 Spar alias Coviran. Other Spar frozen cakes were also reported as delicious and cheap by friends. And none are so sweet like those found amongst Spanish food, all over town. I was food hunting in Tenerife for the perfect cheap Black Forest Cake with real Kirschwasser and genuine Chocolate inside for a long time. Spar frozen vegetables were rediscovered by myself. I was used to food inventions in their frozen food department from South Africa. Now, I noticed they may be traced at the La Paz Spar Puerto de la Cruz, too. What I love about them is exactly that food novelties keep on coming up in this supermarket department with better and better food combinations and presentations. A dream for a foreigner with a holiday home in Tenerife and if only for brunches or mid-afternoon teas... Meantime, going out at night to restaurants on Tenerife Island remains a culinary as well as a social temptation. If only I had just that little bit more time to spoil myself with brand names like Meika sausages and delicious frozen food bought from Spar, at least. Why? The Spar shop in La Paz is a bit out of the way for me and the one in central Puerto de la Cruz has less of a food selection. Hey, if I discover more new stuff at Spar, I will surely declare it a best buy shop. Supermercado 2000 Spar has indeed an advertisement board for the public by its entrance. I don't find it practical to have to go there to stick up a note. Also, I heard some naughty folks sometimes remove notes of others. Internet is so much more practical for advertising. The photo above only gives you some idea on how big this shop is. I estimate, it might be about 30 meters wide by 40 meters deep. This would give it about 1200 square meters. Including offices it should be bigger than that. You can't see the huge fresh dairy and meat counter in the back, by the way. Lets return to Spar La Paz groceries. Recently, I spotted genuine whole wheat oats at Supermercado2000 packaged with the same grocery design and packaging they had 60 years ago. To stick to an ancient brand design like that is absolutely amazing while it's definitely interesting to buy oats like that, even, for double the price of soft and semi whole wheat oats... You need genuine oats like that to make a real Swiss Muesli. I used to buy tinned herrings in very real super fresh tasting cream sauce which I couldn't make for its price nor goodness. Don't ask how much... Does it matter when a special food item is worth its price?. I also buy cheap food at SM 2000 like dried split peas and large size lentils for making soup at rare occasions. If you want exclusive German liquors and wines you sure will find almost all of them at this Spar supermarket in La Paz. If you need Kirsch Schnapps to make a genuine Black Forest cake, you get it there. However, exceptions exist. There is one item, even, SM 2000 doesn't have. Poppy seed for making poppy cake is not to be bought at SM 2000 Spar. The shop Supermercado 2000 Spar was opened in the Northern modern suburb La Paz of Puerto de la Cruz because, many wealthy foreigners started to buy their own holiday home there. This started towards the end of the 20th century. Why? La Paz is cooler and quieter than the old quarters of Puerto de la Cruz. Also, Parque Taoro the venerable, green suburb of the oldest resort of Tenerife became too crowded. A big international Astro physics event in La Palma which involved the Astronomy society of Tenerife put la Paz into the lime light by the mid Seventies of last century. It set the final ball rolling for business and real estate investment. 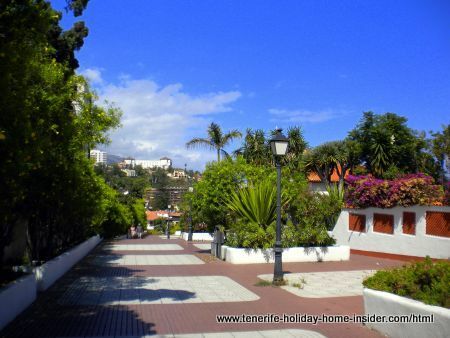 How walk down to the hub Puerto Cruz from Supermercado 2000? It's easy to get back to Puerto Cruz hub turning to the right off Plaza Laurel into pedestrian passage C/Leopoldo Cologán Zulueta. Most of this track is the beautiful Goat trail pedestrian passage Calzada de Cabras. It comes out by the mall for Tenerife convenience shopping Centro Comercial Martianez. An open parking ground is in front of the shop Supermercado 2000 Spar which also has a stand for book exchange and new books.. The book stall has been moved and is now facing the main road. Bistros, restaurants, bars and little shops as well as all sorts of business providers are in the vicinity of SM2000 Spar. Many are also at nearby Canary Center along the main road which leads to Botanic Gardens called Jardín Botánico in Spanish. That's the road to the TF5 freeway. by passing La Cupola Commercial Center on your left. Encounter several hotels close to the Supermercado 2000 Spar, such as large Tenerife conference hotels like the now somewhat dated Hotel Semiramis with top views to the Martianez Bay as well as the acclaimed global 5 star wellness Hotel Botanico, both of which give you free Wifi Internet in public areas. Very recommendable also is the much revamped Atlantic Mirage Suites and Spa next to the Semiramis. All are within less than a five minute radius on foot from the Spar shop of La Paz. There are German and English clubs, such as a British Tennis club and other associations in the neighborhood of Supermercado 2000. Information about the a.m. Spar outlets of the Yellow pages here include street addresses, phone numbers and maps. This may not represent all Canary Island Spar outlets that exist at the moment, as some may have been closed due to the actual Spanish recession, as happened with the one of Puerto de la Cruz in Avda Generalisimo Familia Bethencourt y Molina. All I know by personal experience is that Spar in mainland Spain isn't prominent at all, contrary to its 6 Tenerife shops and some on neighboring islands, such as Valle Gran Rey La Gomera. Just over 1 million Euros of invoicing for Spar Spain, as may be found online, are proof of a rather restricted business turnover. 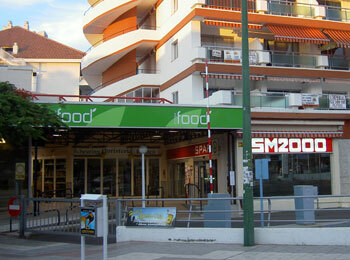 From Supermercado 2000 Spar back to Tenerife shopping Puerto Cruz with more and different exciting shops.